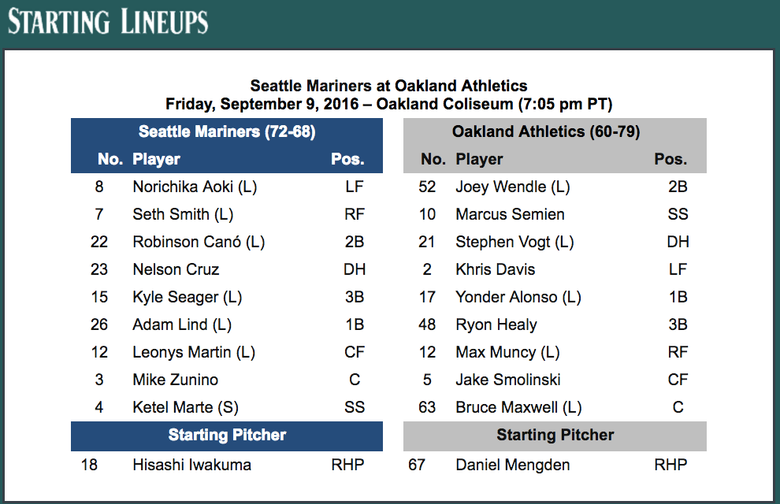 Pregame notes, quotes, matchups and lineups for Friday's series opener between the Mariners and A's. A day after Taijuan Walker got his first win since June 30, he was back working on the mechanical changes with pitching coach Mel Stottlemyre. OAKLAND, Calif. — A day after making an important start in terms of his immediate and longterm future, Taijuan Walker was back out working with pitching Mel Stottlemyre in hopes of finding consistency and comfort while building on the first small steps of progress. Walker and Stottlemyre played catch for about 15 minutes on the outfield grass of the Oakland Coliseum. Walker worked on some of the mechanical changes that Stottlemyre had asked him to make in the days leading up to Thursday night’s 6-3 win over the Rangers at Safeco Field. Walker was noticeably focusing on his leg kick while turning his hips. It’s just one of several subtle changes that feel enormous to him. The Mariners’ coaching staff was still talking about the changes and what they saw the night before in their pre-series meeting on Friday afternoon. Walker pitched five innings, giving up three runs on seven hits with two walks and three strikeouts to get his first win since June 30. Using the new mechanics, Walker issued walks to the first two hitters he faced in the game. It wasn’t ideal. But he didn’t scrap the changes and go back to his old way of throwing — a sign of his commitment to the changes. He worked out of the inning, allowing just one run. *** The Mariners plan to activate Tom Wilhelmsen from the disabled list on Saturday when he’s becomes eligible to return. Wilhelmsen had been sidelined with a lower back strain. He threw a simulated inning on Thursday as a final test. *** Steve Clevenger’s 2016 MLB season is over. The Mariners ended his rehab assignment with Class AA Jackson because of lingering soreness in his throwing elbow. Clevenger had just reported to the Generals and was going to serve as DH for the team. Clevenger suffered a fractured right hand on a foul tip on June 29. He had surgery to repair the fracture and was eligible to return from the 60-day disabled list on August 29. *** Servais said they will call up a handful of player when Class AAA Tacoma finishes its playoff run. But he hinted it would only two or three players at most. First baseman Dan Vogelbach and outfielder Stefen Romero are likely candidates. 1985 – Gorman Thomas belted his 250th career home run, his club record 30th of the year, to pace the Mariners to an 8-7, 12-inning win over Cleveland in the Kingdome. 1991 – The Mariners turn the seventh triple play in their history. Toronto’s Joe Carter grounded to 3B Edgar Martinez who threw to 2B Harold Reynolds to force Roberto Alomar. Reynolds relayed to 1B Tino Martinez to double up Carter. Martinez threw to C Dave Valle covering the plate to nail Devon White who was trying to score from second on the play (5-4-3-2). Fifth inning. 2001 – Bret Boone broke the 67-year-old RBI record by an AL second baseman (128). 2002 – Ichiro and Desi Relaford hit back-to-back homers (off Aaron Myette) to begin Seattle’s game in Texas, marking the first time in club history the Mariners hit back-to-back homers to start a game. Seattle lost the game 12-7. 2010 – Ichiro Suzuki becomes the first major leaguer with ten consecutive seasons with 200-hits. The Mariner right-fielder extends his own record with a fifth-inning single to center in the Mariners’ 1-0 loss to Toronto at the Rogers Centre. 2011 – Alex Liddi recorded his first Major League hit and Ichiro went 4-for-5 with a home run to lead the Mariners to a 7-3 win over the Royals. 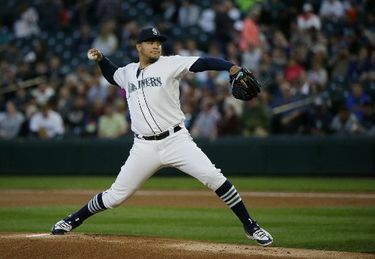 2015 – Vidal Nuño was outstanding, allowing 1 hit over 7.0 IP, snapping a 20-game streak of starts without a win in the Mariners 6-0 victory over the Rangers…Nuño struck out a career-high 10 batters and won his first game since June 27, 2014 with NYY.